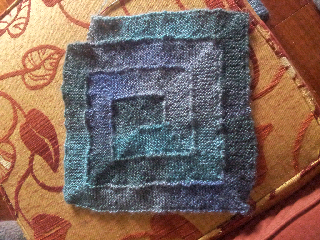 This week has been all about the garter stitch. It's mainly because it's been Wimbledon fortnight and lace is too complicated for tennis watching. I finished my Color Affection Shawl so I will show that off on Friday, but I needed some more garter stitch. I picked up my long abandoned 10 Stitch Blanket and started knitting. This is as far as the Men's Quarter Finals has taken me. It's been a perfect tennis companion.